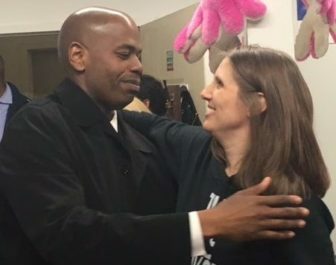 Joshua Hall is congratulated by Lindsay Farrell, executive director of the Working Families Party. Joshua M. Hall, a teachers’ union official and former treasurer of the state Democratic Party, won a special election in Hartford for the state House of Representatives on the Working Families Party ballot line Tuesday night, defeating two other Democrats. In Watertown, Republican Joe Poletta, who sought the same seat as the Democratic nominee in 2014 , easily won in 68th House District, succeeding the Republican who beat him more than two years ago, Eric Berthel. Hall succeeds Democrat Douglas McCrory in the 7th House District. The Hartford race had the flavor of a Democratic primary, pitting Hall against Rickey Pinckney Sr., the Democratic-endorsed candidate, and a petitioning candidate, former Rep. Kenneth P. Green, D-Hartford. Hall is only the second candidate to win a Connecticut legislative seat as an WFP candidate, the first in the House. A registered Democrat, Hall said he will be a member of the House Democratic majority. Edwin A. Gomes of Bridgeport, who won a special election to the Senate on the WFP line in 2015, is a member of the Senate Democratic caucus. The two races Tuesday return the House to full strength, producing a 79-72 advantage for Democrats — the same results as the general election in November. Berthel and McCrory resigned their House seats after winning special elections to the Senate. Unofficial results showed Hall with 625 votes to 512 for Pinckney and 367 for Green. House Minority Leader Themis Klarides, R-Derby, said Poletta won with more than 75 percent of the vote over Democrat Louis P. Esposito in a district that covers Watertown and a portion of Woodbury. Hall, a vice president of the Hartford Federation of Teachers, is a strong backer of the city’s public schools, a defender of collective bargaining rights for public employees and a proponent of a progressive budget. Hall had a narrow lead until the returns came in at 9 p.m. from the Rawson School in Blue Hills, a middle-class neighborhood in the city’s predominantly black North End, and cheers erupted at the WFP headquarters. Jonathan Harris, a former executive director of the Connecticut Democratic Party now exploring a campaign for governor, was among the Democrats congratulating Hall at the WFP headquarters. The Hartford race exposed tensions between Democrats and the Working Families Party, a labor offshoot that fashions itself as the progressive conscience of Connecticut politics. Pinckney’s campaign, which had the support of city and state Democratic leaders, hit Hall with a mailer questioning his Democratic bonafides in a city with an all-Democratic legislative delegation. Hall had sought the Democratic endorsement. The Watertown race had its own controversial mailer: Since Poletta had been a Democrat, the Esposito campaign attacked him as a one-time support of Gov. Dannel P. Malloy, a Democrat.